The app enables users to burn almost any video file to DVD, while providing options to edit the video including trim, crop, flip, making personalized DVD menu and adding special effects for DVD. Several supported formats include AVI, MOV, FLV, MPG, WMV, M4V, MPEG, DAT, VOB, 3GP, HD video files. Want to make your own movies? Or maybe you just want to finally burn that film collection on your computer to DVD. Whatever you want to watch, Wondershare DVD Creator does it all. Simply drag your favorite feature film into DVD Creator for Win (Windows 8 supported), adjust the quality and click burn. Or use DVD Creator’s powerful built-in editor to combine your own photos, videos and music into home movies, slideshow, really whatever your imagination can handle. Burn video to DVD from all popular SD video formats, including AVI, MP4, MPG, MPEG, 3GP, WMV, ASF, RM, RMVB, DAT, MOV, etc. 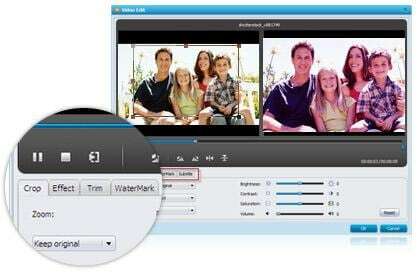 Burn HD video like MTS, M2TS(AVCHD H.264), TS(MPEG-2), HD MKV(H.264, MPEG-2 HD), HD WMV(VC-1), HD MOV(H.264, MPEG-4), etc. Burn all video formats to Blu-ray discs such as BD-R, BD-RE, BD-25 and BD-50. Adjust video brightness, contrast, saturation and other special effects for a better visual experience. Support all popular recordable disc types: DVD–5 and DVD–9; DVD-R, DVD+R, DVD-RW, DVD+RW, DVD+R DL, DVD-R DL, DVD-RAM;BD-R, BD-RE, BD-25, BD-50.